We write to describe our feelings to the reader. We can’t impose a thrilling terror upon somebody by just saying “I was very afraid”. We can’t explain how disgusting a ripped shirt with oily stains can be with “it was very dirty”. When a direct description is not enough, we can play with words. For this, we have personifications, oxymoron, puns, synecdoche, and other figures of speech. But it is the simile that is the most simple, common, and efficient way to make your writing more imaginative. A simile definition is very simple. It is a figure of speech that is used for comparing two things. When we make a comparison using a simile, we always use the words “like”, “as”, “so”, “than”, “alike”, or “resemble”. These words are important, as there are also metaphors and hyperboles that are aimed to compare things, but they are formed differently. So, the quickest way to distinguish a simile from other figures of speech is by paying attention to whether there is “like” or “as” in a phrase. You can easily mix up similes, metaphors, and hyperboles from time to time. It’s not that knowing the difference between them will help you to use them properly, or it will have any impact on your daily life, but if you are a linguistics nerd (like we are), you might be interested in knowing how to distinguish them. A simile, a metaphor, and a hyperbole are figures of speech that make your text more imaginative. The three of them compare things, and that is all they have in common. A simile compares something to something using words “as” and “like”. 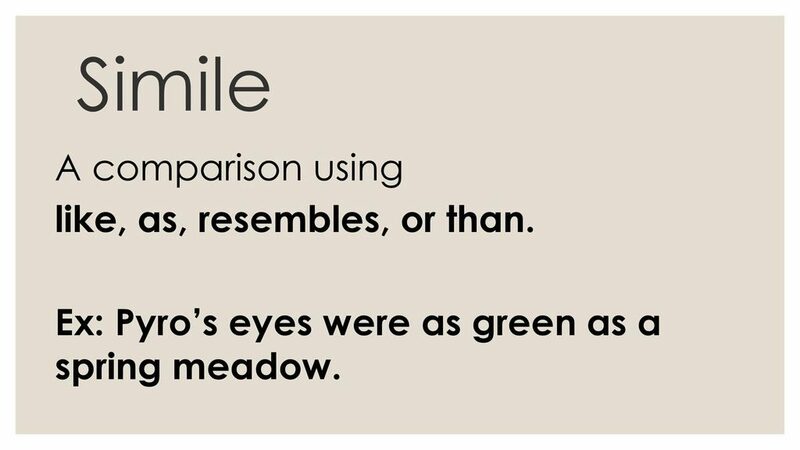 Similes can be short and extended—complete (e.g. : He acted like a pig) and incomplete (e.g. : Like a pig, indeed!). They can compare an action (e.g. : to sleep like a log), or a property (e.g. : dry as dust). A metaphor equates one thing to another without actually comparing the two (e.g. : He is a pig). A hyperbole exaggerates and can do it in any form, including a simile. That means a simile can be hyperbolic. For example, when we say “he eats like a pig”, we mean he eats very untidily, though he still uses his hands, and eats from a plate. So, his eating habits are not exactly the same as a pig’s way of chowing down. It’s a hyperbole, though by its form (as we compare two creatures with a “like” word) it is still a simile. Both Mitchell and Laplace thought of light as consisting of particles, rather like cannon balls, that could be slowed down by gravity, and made to fall back on the star. Falling through the event horizon, is a bit like going over Niagara Falls in a canoe. It is like burning an encyclopedia. Information is not lost if you keep all the smoke and ashes, but it is difficult to read. The problem of what happens at the beginning of time is a bit like the question of what happened at the edge of the world, when people thought the world was flat. Energy is rather like money. If you have a positive bank balance, you can distribute it in various ways. *A short analysis has shown that an article of 3 pages written by Stephen Hawking contains on average 6 imaginative similes, and that is 5 imaginative similes more than similar texts of the same volume by Michio Kaku, Carl Sagan, and Neil deGrasse Tyson. No offense to these three, but that explains why Stephen Hawking won a Nobel Prize and was considered the brightest science popularizer of the epoch. He just put the memories away, like old silverware that you didn’t want to tarnish. Sam Vimes felt like a class traitor every time he wore it. There were a few seconds for the troll to work out the spelling, a distant heavy thud, a sound like a swarm of hellish bees, and then a crash of tiles and masonry. There were a dozen bedraggled ravens behind him, looking like old men in ill-fitting black cloaks. *Actually, there is one thing that is true both for a simile and for a joke. It’s better to have none than to have a bad one. But please. Don’t use this list in your writing if you don’t want to look like a 90-year-old English teacher from an Amish nursery. The similes above are as boring as beans, as common as mud, and as dead as a dodo. Your text deserves more than lifeless clichés. Let’s try to work on it together. Think of 5 similes with “red as”, “white as”, and “beautiful as”. Write the second part for “eat as”, “walk as”, and “drink as”. Try another track. What can be “as a lumberjack’s beard?” Who can act “like a frightened koala?” Think of the most imaginative and unpredictable similes. And remember, a simile should be as clear, bright, and easy to understand as rusty nails on a rainy day.